but the cost of care is too great? Oftentimes, pets face an uncertain future when they become sick or injured simply because treatment is unaffordable. It’s called economic euthanasia. 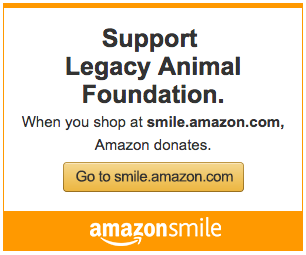 Legacy Animal Foundation is a 501(c)3 non-profit, charitable organization founded in 2012 that focuses on providing financial assistance to help cover the cost of medical treatments of animals in need by providing grants to qualifying shelters, rescue organizations, and pet owners. One-hundred percent of all money raised goes towards covering the medical costs of animals in crisis. Every animal deserves the best care! Our mission is to eliminate economic euthanasia by providing grants to help pets in crisis.